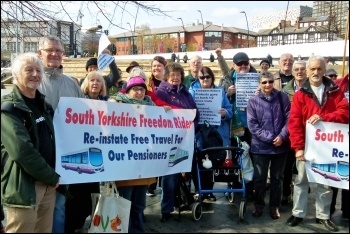 South Yorkshire Freedom Riders held rallies on 1 April marking five years of our struggle for the full restoration of travel pass rights. Pensioners and disabled people started with a rally at Barnsley Interchange before setting off on a 50-minute bus ride to Sheffield. Over 70 rallied at Sheffield station including local trade unionists and members of the public, both old and young. In 2014, our free local train travel in South and West Yorkshire was removed entirely and our rights to free bus travel restricted. After holding several 'freedom rides' - catching trains en masse and refusing to pay - South Yorkshire's councils backed down. Disabled pass holders won all rights back but pensioners only gained partial concessions. Pensioners can catch a train for half-fare within South Yorkshire but a train to West Yorkshire is charged full-fare. So, Sheffield to Leeds return, once free, is now £12. We have continued the fight to have all rights restored. The concessionary fares budget has been hugely underspent every year since 2014 - meaning that the lost concessions could have been paid for several times over! Yet with the Labour councils continuing to carry out Tory cuts, this unspent money has gone to shore up reserves. London, Manchester, Merseyside and the West Midlands all have free local train travel for the elderly. This should be extended across the country. We're also fighting for a bus network that meets people's needs. Cuts in the network have left some Barnsley villages with no service at all. The Sheffield bus network was cut by 10% in 2015, with further cuts to many routes since. Buses that ran once every ten minutes are now hourly. Workers often can't get a bus to work. People with mobility difficulties are having to pay for taxis to get to the doctors and local shops. Travel pass rights are no use if there is no bus! We need a big expansion of public transport, with more routes and higher frequency, together with low fares. And for public transport, including trains, to be taken into public ownership, under democratic workers' control and management.